The Tourists Newcastle City Hall 23rd February 1980 The Tourists were, of course, the pre-Eurythmics band of Annie Lenox and Dave Stewart. I’d seen Stewart perform with local Sunderland folk-rock band Longdancer a number of times, and was a little surprised to see him pop up in a post-punk pop band. However this particular post-punk band had its roots in folk and 60s pop. Harry Doherty, writing in Melody Maker, drew comparisons with Fairport Convention (not sure that I quite see that) and the Mamas and the Papas (I don’t quite see Annie or Dave as Mama Cass either 🙂 ). 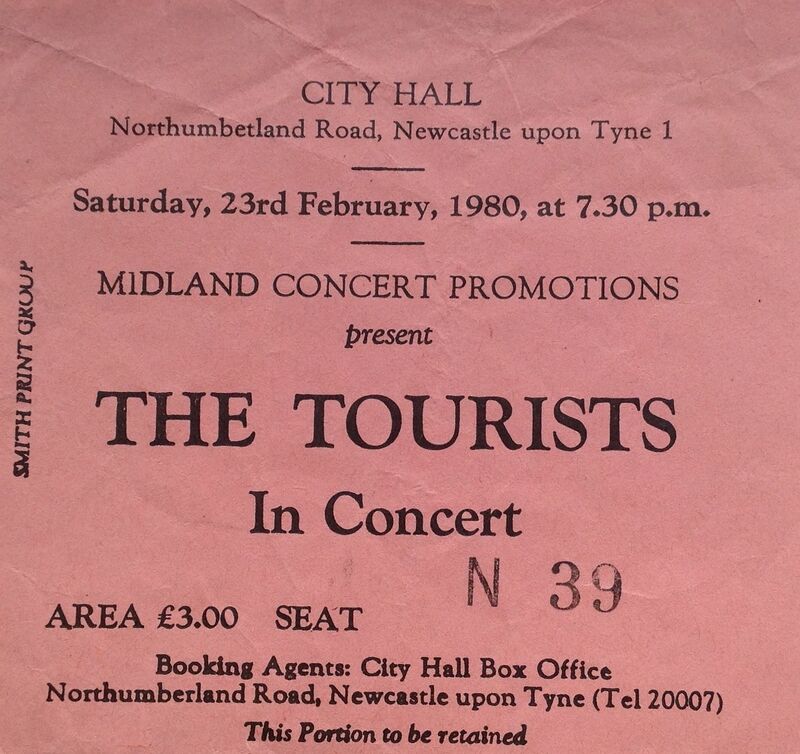 The first time I saw the Tourists live was on 10th May 1979 when they supported Roxy Music at Newcastle City Hall. They put in a good performance, warmed the crowd up well, and won a few friends that night. I saw them again a few months later on 24th August 1979 at the Reading Festival, sandwiched between performances by Motorhead and Friday night headliners the Police. I remember the Reading performance well; the Tourists had some great songs, particularly the Peet Combes compositions “Blind Among The Flowers” and “The Loneliest Man In The World”, which both featured in their performance that night and came over well on a cool summer evening. Both songs were released as singles. The Tourists went down quite well with the Reading crowd, particularly considering that most people who were there had come to see Motorhead; hardly the sort of crowd to appreciate a new punky pop band. They had some problems with the sound that night: “The only thing that freaks me about touring, is the equipment…It’s right out of your hands if it goes wrong. That’s what happened when we did the Reading Festival. It was mayhem onstage, really frightening.” (Annie Lenox, Record Mirror, 1980). Peet was the main songwriter in the band at the time, and wrote all of the songs on their first album. I saw them again on 19th October 1979 at Newcastle Polytechnic, by which time they had made No. 4 in the UK singles chart with their cover of Dusty Springfield’s “I Only Want to Be with You”. A drunken Friday night student crowd danced and sang along with Annie. I thought at the time that “I Only Want to Be with You” was a strange, and for me somewhat disappointing, choice for a single; given the strength of their original material. However, it worked for them, and gave them their first big chart success, helped by Annie’s great performance on Top of the Pops. By the time the Tourists went out on their first headline “Last Laugh” tour they had released a new single “So Good to Be Back Home Again”. 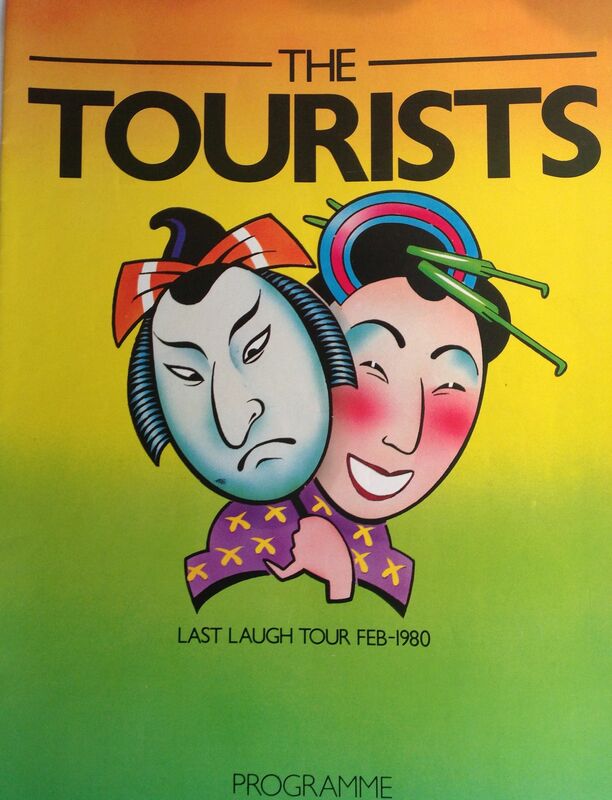 I saw them at Newcastle City Hall on 23rd February 1980. A great performance; good fun straight-on pop. Support came form Edinburgh band the Solos. From the programme: “A short story from a short person. I can’t understand what I’m doing in this group when I’m such a brilliant footballer, but life takes strange twists and I twisted my knee, which ruined my chances of captaining England back in ’69” (Dave Stewart); “Pigtailed and precocious, the envy of all the potential Shirley Temples of Abderdeen, I started to learn the flute and went to play in military bands, symphony orchestras, chamber ensembles, etc….” (Annie Lennnox); “I was setting up my kit at 10 in the morning in a studio in London when in walked in Dave Stewart. Now, Dave and I had met in a hotel in Amsterdam when he was playing in Longdancer and I was with Colin Blunstone. We had hit it off really well together and as I remember I got very drunk.” (drummer Jim Toomey); “No great history – the only bands I ever played in were Peculiar Star (in Sunderland an experimental toy instrument idea…) and the Tourists.” (Peet Combes); “Q. Edward, do you really come from outer space? A. YES! I’m from the Orion!” (bassist Eddie Chin).